Earlier today, Jean-Claude Biver (CEO of TAG Heuer) was joined by Matthew Vaughn (Director, Writer and Producer) and Toby Bateman (Managing Director of Mr Porter), for the launch of a very special smartwatch. TAG Heuer has partnered with Kingsman: The Golden Circle to release a special edition of the Swiss brand's Android Wear watch. 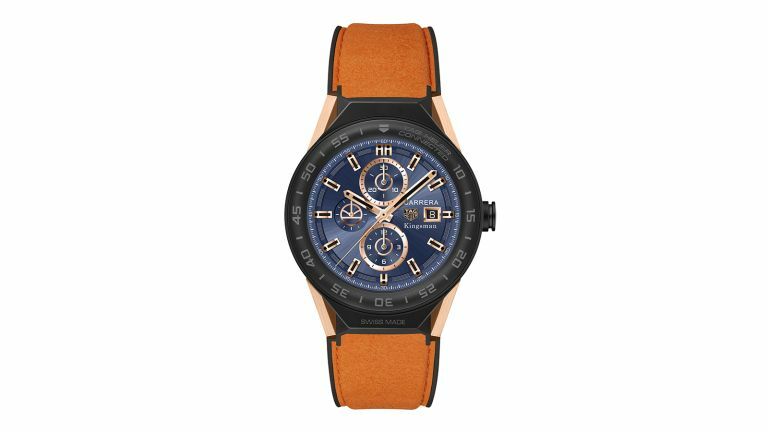 The Connected Kingsman Special Edition doesn't have any additional features over the standard watch (no sonar, or integrated stun gun, unfortunately), but it does come with an orange leather strap, Kingsman branding, and a custom watch face. It's undeniably a handsome piece. Of course, the watch will also feature in Kingsman: The Golden Circle - with a few special tricks up its sleeve. You'll be able to buy the TAG Heuer Connected Kingsman Special Edition online, exclusively from Mr Porter, and you can see it in action in Kingsman: The Golden Circle from September 22nd 2017.